A lot of jewelry retailers and designers benefit from joining trade shows and craft events. It opens great opportunities to meet new people and establish better connections. But there is a lot of things to consider in order to make this experience more worthwhile and beneficial for your business. When joining trade shows, it’s important to make good use of your time. As a common rule, make sure to come at least two or three hours before the show to have enough time to set up your whole necklace display. But to be more productive, it’s extremely important to develop a fast and effective way to set up your display without spending most of time putting up everything from scratch. This will also decrease the time you have to spend taking down and putting away your stuff after the show. Want to know some tips on how you can do it? Here are our tips. Most jewelry sellers have the tendency to want to bring everything just in case people will be looking for some item. However, bringing a lot of inventory can be difficult, so to avoid any problem, try to bring only the items that sell the most and then bring a little of the new stuff to show interested buyers. If they ask for other items, you can refer them to your website or Facebook page to see more of your collection. Putting each item one by one can be tedious and awfully time consuming. Instead of moving each item, consider using display trays and carriers to display necklaces, rings or even bracelets. This way, you can put together different items at home before going to the show, and then just arrange it on your display table as soon as get to the event location. When renting a booth at a trade show, consider the manpower you have and the time you need to get you set up ready. Although it’s nice to leave some room for your customers to go around your booth, you still have to consider if you and your team can arrange the whole set within the allotted time. Bigger space may mean bigger set up. Get a space that is both practical and manageable to let you save more time and resources. Spending most of your time fixing your display will take away your opportunity to talk and communicate with your customers. Find more smart ways to display your jewelry by asking other jewelry store owners or by joining forums and communities online. The internet is a place of great opportunities. It’s a great avenue to those who are looking for a way to showcase their talents while earning some money on the side. However, putting up a website or joining an E-commerce site does not guarantee that you can make it big right away, especially if you’re into fashion jewelry and handmade accessories. Compared to having a physical store, running an online jewelry business is actually more challenging than most start up entrepreneur can see it. Unlike other products, people buy jewelry based on the look and feel of each piece. And because customers can’t see your actual earrings or necklace display, they will be more hesitant to click the purchase button. In spite of these challenges, it is undeniable that there are a lot of online retailers who found their recipe for success by selling their items online. If you’re planning to establish your own online jewelry store or looking for ways to take your business further, here are some tips you should remember. In the absence of physical jewelry display, you should do your best to take a photo that can grab people’s attention. Start by looking on different fashion websites or magazines and take inspiration from them. Use different props and background to give more life and color to your jewelry collection. A high quality camera can also help you take the best shot so make sure to invest in one. Aside from taking a creative photo, you should also display photos that can inform your customer about your products. Take photos from different angles (side view, top view, etc.) to give them a better look at your collection. You can also take photos of the detail of your jewelry such as the clasp, posts, gemstones, etc. for better appreciation. Mention the metal used and the method you used in creating your jewelry. Indicate the color, the origin of the materials and the meaning of the gemstones used in your necklaces or rings. The more people know about your item, the most likely they will purchase your products. Assure them the quality of your products by mentioning the number of hours you spent in creating handmade jewelry and the quality of materials used in creating each piece. Give more value to your jewelry by writing a back story about your work. Write about why you decided to create such jewelry and how you came up with that design. You can also mention the different occasions in which your jewelry can be worn and what kind of outfit it is best to pair with. Do you find these tips helpful? Don't forget to share it with your jewelry loving friends! We usually see them in white and black, but if you want to make your display stand out, there are fun alternatives that can take your display up a notch. When displaying your items in your physical store or during trade shows and craft events, it is important to keep it catchy and interesting to your customers. Instead of sticking on the usual, you can always go for something different and unconventional like colored display trays for all your jewelry collection. Although it’s little challenging to style and decorate your display table while using colored trays, it also pushes you to create something new and unconventional for your customers. 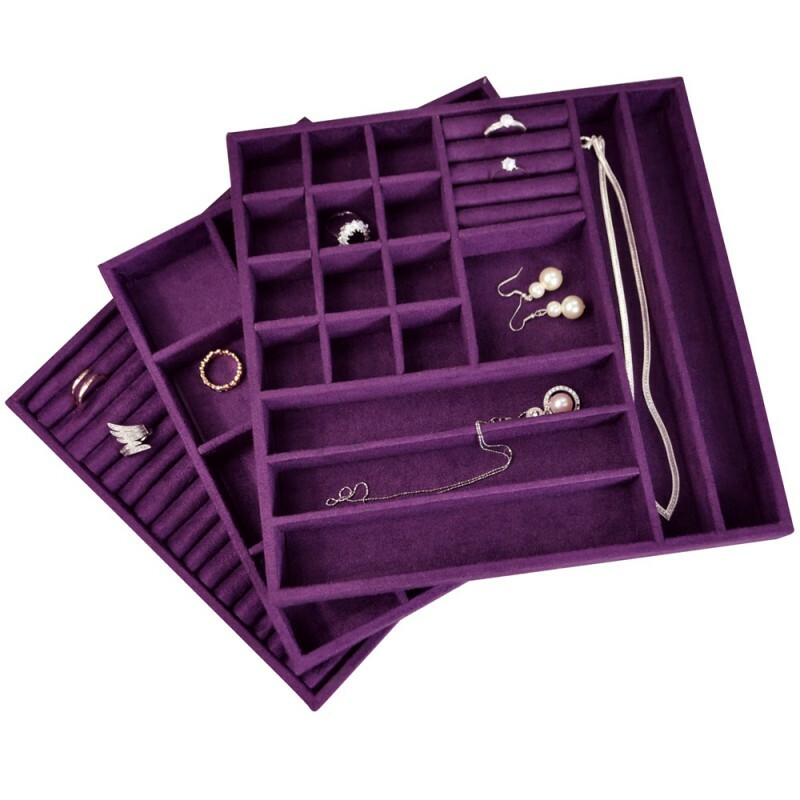 When ordering your display trays, simply look for colors that best fit the colors of your earrings or necklaces. 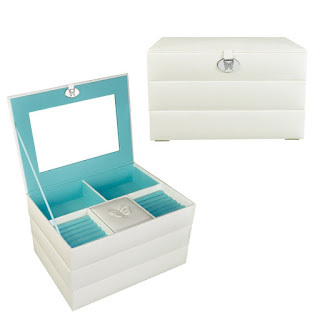 Purchase necklace display trays in contrasting or complementing colors to let your jewelry shine. When done the right way, you can definitely come up with a unique and engaging display. If you’re still feeling a little hesitant on using colored displays, here are three reasons why it’s best to use colored display trays. Here are some colored display trays that you can use in your jewelry display. Have you experienced using colorful displays for your jewelry business? Share us your experience by writing in the comment section below. A display tag is not just a piece of paper that you use to put on your jewelry pieces. When done the right way, it can be used to catch the attention of your customers and establish better awareness about your brand. When creating a display tag for your jewelry, you have to think of a material that is strong enough to hold an earring or a pendant. A material that is too thin or too light will wrinkle easily and will look ugly on your display. You can use different materials such as card stocks, thin plastic, cardboards or cloth in creating a unique tag that can set you apart from other jewelry sellers. Also choose the best materials that will make your necklace display look better. Display tags can also be used as a promotional tool, so don’t forget to include your business name and logo in each tag. Make sure it is placed in a spot where it can be easily noticed by your customers. Highlight it by using a different shade of color or putting it inside a frame. Be as creative as you are with your logo and name as it will be something that people will remember about your brand long after they make a purchase from your store. Adding your contact information at the back or at the bottom of your display tag is a smart way to let your customer know about your details. Aside from your phone number, store address and email address, you can also put your social media handles like Twitter, Facebook or Instagram account. Having a catchy tag line is a great way to appeal to your customers. So come up with something witty, unique and different to get your desired effect. It’s also great if you can keep it short with just a few words and make sure to print it in clear readable letters. You can get a quote from a book or from a popular celebrity or come up with your own. Write something that has to do with fashion or something that can tickle everybody’s imagination. Do you also use a display card for your jewelry? How does it help make your jewelry stand out from the rest? Share your thoughts with us! June Facebook Giveaway: Win an Adorable Zipper Pouch! It's time for another Like to Win Giveaway on our Facebook page! This time, we’re giving away an adorable zipper pouch that can be perfect for carrying around school or craft supplies anywhere you go. Joining this contest is easy. Just visit our Facebook page and make sure to hit the “like” button. After completing this step, go to giveaway tab on our profile and fill up the form with your name, email address and birthday. Hit enter for a chance to win this month’s promo. One entry is allowed per Facebook user, so don’t forget to invite your friends to join. Promo runs until July 1, 2014.Winner will be announced on our Facebook page and will be notified through email. Jewelry making and designing can be a lot of fun, for some, it can even almost be addictive. Creating accessories allow you to channel your creativity and imagination into something impressive and noteworthy like necklaces or earrings and bracelets. It also brings a lot of self-satisfaction and is even believed to relieve everyday stress. But if you really want to be successful in the jewelry industry, it is also important to take your eyes away from your jewelry every once in a while. Taking a time off can give you more time to explore different trends and do the necessary actions to improve your business such as finding new ways to create a ring or necklace display. As we all know, fashion is fickle and what’s hot today may not be as popular in the next few weeks. Although it is not advisable to go chasing trends, it still important to keep yourself updated with what’s happening in the fashion industry, most especially, in your chosen niche. Here are some of the best ways to keep up with the latest in your niche market. Attend related events - special events like community meet ups, charity events and shows are great ways to get to know people that can influence your craft either as a potential customer, supplier or a business network. Subscribe to online newsletters – get to know the latest in your industry before everybody does by subscribing to newsletter of popular websites related to jewelry. You can also download or purchase ebooks or newsletters that can teach you new techniques to improve your craft. Follow celebrities – people in show business are great indicators of what’s trending in the fashion industry. Take note of their outfit as well how they accessorize it to get an idea of what people might be interested in. Watch movies, music videos or TV shows – media is a great influence on how people dress up and accessorize. When you’re watching TV shows or popular movies, take note of the earrings worn by the characters, or the rings given as a gift. These little significant details may affect your customer’s preferences. Plus, it can also serve an inspiration when you’re creating new jewelry design. How about you? What are you doing to keep up with what’s hot in jewelry industry? Bead storage is essential for any jewelry maker because it will make knowing what supplies you have on hand a breeze. We recommend investing in clear, plastic bead organizers for the best results. You can easily stack them and pack them up in your travel case or home workspace. These bead organizers are idea for gemstones, spacers, small findings, and seed beads. The beauty about using clear organizers is that you can easily see all of your supplies, plan out new designs, and keep inventory of your existing collection. Another inexpensive alternative to purchasing clear containers is using Mason jars to store your beads. Although this is not a good option if you plan to travel with your supplies, this is an excellent option for those with a home work space or crafting room. Mason jars can also be decorated in a wide variety of ways for added charm. You can tint them, paint them, embellish them, and so much more. Keep in mind that not all of your supplies may fit well in the spaces provided from your clear storage from your necklace display case. Rondelles and rounds can tend to take up more space so bigger containers may be needed. 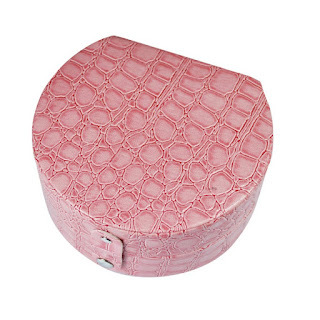 If you have an extensive collection utilizing organizers with round individual containers is also a great option. We have some cases that contain up to 30 containers with screw-top lids. For added organization invest in a sticker label printer! We recommend purchasing a handheld variation for ease and comfort. Having these supplies will make staying organized as easy as 1,2,3! What does your workspace look like? Comment your ideas for bead storage in the comments below. We'd love to hear from you. Check out our slideshare page for more jewelry tips! 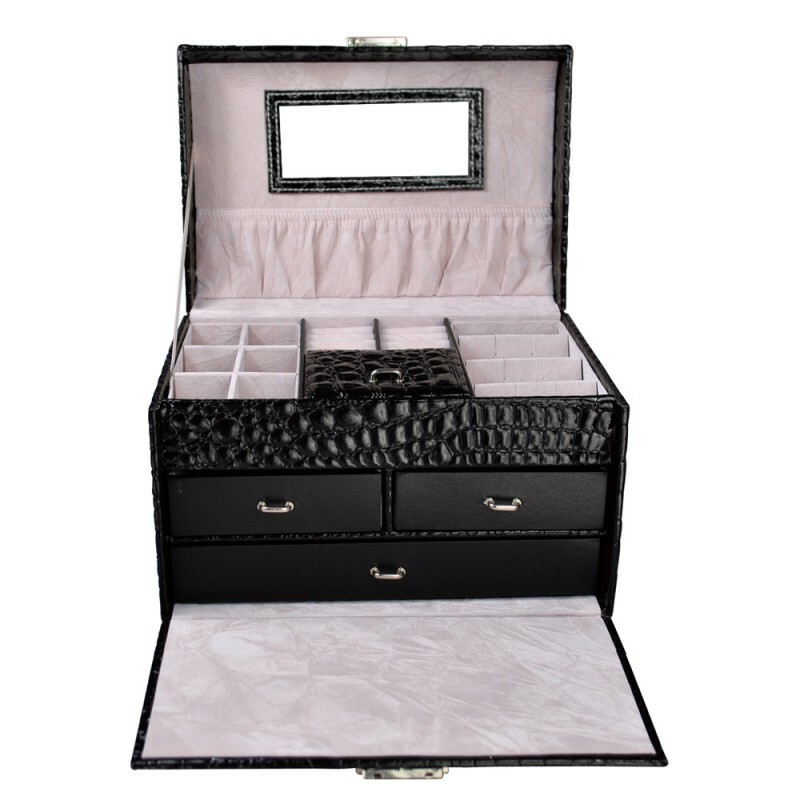 Looking for Jewelry Display Trays? Read these Tips! Joining trade shows can be really challenging if you don’t have the right tool to display your collection. Although you can find different display cases, it is still important to be smart in your choices when buying a necklace display for events or shows. Below are just some of the things that you should look for in your next purchase. When looking for a display tray, sturdiness and durability are the first things that you must consider. Purchasing high quality display trays will keep your jewelry inventory safe during trade shows or craft events and will keep your jewelry organized during transport. As a jewelry seller, it is important to learn how to protect your inventory from possible damage especially when traveling long distances. You never know will what happen, especially during an outdoor event. Aside from rain or scorching sun, you must also be mindful of strong winds. Don’t be caught unprepared. Purchase a display tray that won’t be easily knocked off by the wind and can be easily taken down in case of rain. Also remember to keep your display away from direct sunlight as it can be harmful to your jewelry. Organizing your inventory can be a lot easier with stackable display trays. Instead of getting big and bulky, opt to buy trays that can be easily stacked up to save more space and preparation time. Plus, stackable trays are also easier to carry around or transport from your workspace to the event’s place. Cleaning your jewelry trays can help keep your display looking great despite your busy schedule. But when you’re all busy, cleaning and keeping your jewelry organized can be more challenging. Fortunately, there are different jewelry display trays that can be easily cleaned with damp cloth or common cleaning solution. Display tray is a must have for jewelry sellers and designers. To make the most out of your money, remember to buy affordable display trays from your reliable supplier. Don’t forget to check different websites for volume discounts or promo codes to take advantage of the ongoing price cut offer. Display trays are great tool every jewelry makers and designers must have to keep you on top of the game. 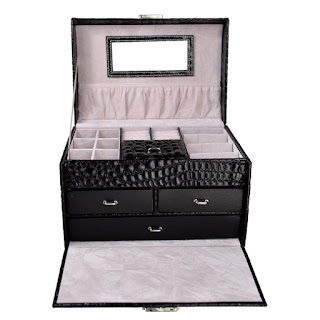 Visit our website for a wide selection of jewelry displays and supplies.